Post all Bills FA wish lists here! I want to see the Oline fixed in free agency even if we have to overspend to do it. That will open up the draft to trade bk and load up on skill position players. 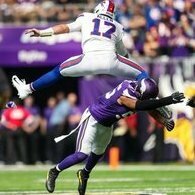 @RyanTalbotBills put this on Twitter yesterday https://www.newyorkupstate.com/expo/sports/g66l-2019/02/758e3a7e581264/be-the-gm-play-the-buffalo-bills-15-2019-free-agent-challenge.html and it looked like fun. Using this game I’ll take Brown, Maxx Williams, Paradis, Daryl Williams and Jordan Phillips. Replacing Nate Solder in New England, Brown was outstanding in his first season after coming over from San Francisco. The former seventh-round pick is one of the biggest offensive linemen in the league and probably deserving of a Pro Bowl appearance through four seasons. Now proving he can handle the left side, Brown is in for a huge payday. It will be interesting to see how much interest the Pats have in retaining him, especially after spending a first-round pick on Isaiah Wynn in 2018. I'd like to see the Bills get either Broncos Paradis, Chiefs Morse, or Panthers D. Williams. Give me OT Daryl Williams, C Mitch Morse, WR Adam Humphries, TE Jesse James and DL Jordan Phillips in FA. Then trade back in the first for another 2nd and draft DL Wilkins, WR Harmon, G Risner, TE Knox, and BPA the rest of the way with a RB and CB somewhere in there. I like Nick Boyle more than Maxx Williams. I'm going to cheat and use my $15 on: Paradis / Saffold / Trent Brown / Maxx Williams / Humphries / Phillips. OL - we need improvement here across thre line. DE - we need improvement here at a minimum to get a pass rusher and to fill in Kyles departure. Sign 3 starting offensive lineman. Center, Guard, Tackle. If we DONT trade down with Washington, then I would sign a TE too like James or Harris. If we are trading down, then I would use one of our then three picks in first 2 rounds to draft a TE instead of Free Agency. 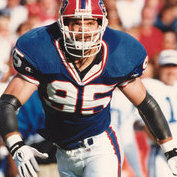 The Bills need a real deal Center this year, preferrably in free agency. That'd be at the top of my shopping list. Given that the OL will have a new coach, you want somebody who has real game experience in properly executing line calls. No more half measures Walter. Humphries is a name I hadn't really considered, but I think he's very good as a slot guy. I would be perfectly fine signing Humphries to lock down our slot and taking a WR in round 2-3 to go with Foster / Zay / Duke Williams. Put the real money on the lines, especially guys like Saffold who might simply be victims of a cap squeeze on their current team. Bandit had the great suggestion that Beane should try to swing a trade for Jason Kelce. That would be an ideal player/personality/contract to add, IMO........and at this point, given their salary cap situation, the Eagles might be comfortable with moving him and drafting a young C.
I will share this tweet because I would like to see it and I think it has a decent chance of happening, since the Bills offered him a 3 year deal last year in FA. I do not think The Abolitionist will want to re-sign with the Ravens. The other team in the mix with the Ravens and Bills last year in FA for him was the Raiders, and they now have a different GM so they may or may not still be interested. I would like a player that would love to play in Buffalo for a reasonable price. Not the guy looking for the highest bidder. I would love a player that can stay out of jail or the suspension list and actually play on opening day. A healthy player without knee braces would work for me too. I like John Brown at a decent price. I think he’d work well to round out the WR corp with a draft pick. Im also a fan of nabbing Randall Cobb of he hits the market. He might be the best available WR with regards to getting open in the QBs eyesight during a scramble. That could be an invaluable resource for J Allen. We could of had Sammy for that money.